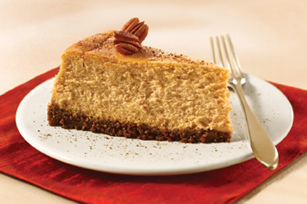 You will not believe how easy pumpkin cheesecake is to make with this easy recipe. A crustless pumpkin cheesecake pie, all the ingredients are mixed in a blender. An alternative to traditional pumpkin pie, this creamy pumkin cheesecake is a perfect dessert for fall. 1. Heat oven to 350 degrees F. Spray a 9-inch glass pie plate with cooking spray. 2. Combine pumpkin, cream cheese, vanilla, eggs, sugar, baking mix and pumpkin pie spice in blender. Cover and blend on high speed about 2 minutes or until smooth. (Or beat in medium bowl with hand mixer for 2 minutes.) Pour into pie plate. 3. Bake for 40 to 45 minutes or just until puffed and center is set (do not over bake). Remove from oven and cool completely, about 1 hour. Refrigerate at least 3 hours until chilled. Garnish with pecan halves, if desired. Serve with a dollop of whipped cream. Store covered in refrigerator.